The Eden raised garden bed with trellis is a great 2 in 1 product for DIY gardeners looking for an attractive and functional alternative to in ground gardens. Constructed from solid fir wood (which is rot resistant) and easily assembled with a handful of screws and a Philips screwdriver, taking most under 1 hour to assemble, the Eden raised garden bed with trellis is both attractive and functional. Standing over 11 inch tall, this design allows for deep rooted plants and perennials. The garden bed is 4ft x 4ft and with the trellis stands at 44 inches tall. Each panel is reinforced to prevent warping overtime and add to the strength of the entire raised garden bed. The trellis is very easy to assemble with the simple Lincoln log locking system and is made from the same non-rotting fir wood to assure years of use. Solid fir wood is rot resistant. Assembly takes minutes with no tools required. Unique design allows for built in ground anchoring. Classic White gardens pop in your garden and accent traditional home styles like Colonial and Cape Cod. The 8-inch-high stacked side boards give you lots of depth to grow both underground veggies like onions, garlic and carrots, as well as tall plants like tomatoes, corn or sunflowers. As shown, your 4 ft. x 16 ft. x 8 inch raised garden bed provides 64 square feet of planting area. You can redesign your garden at any time by assembling your available boards and brackets in new ways. Each modular kit includes ten of our 1 inch Classic White composite boards and ten 1 inch stacking brackets. The insulating open-channel boards trap air, providing insulation to your soil. Keeps soil warmer in the Spring and Fall, and cooler in the Summer, so you can grow for an extended period. Our Raised Garden Bed Brackets pivot 270 degrees, allowing endless design options. Raised Garden Bed With Trellis (4 ft. X 4 ft. X 11 inch ) W/ 44 inch Trellis The Eden raised garden bed with trellis is a great 2 in 1 product for DIY gardeners looking for an attractive and functional alternative to in ground gardens. 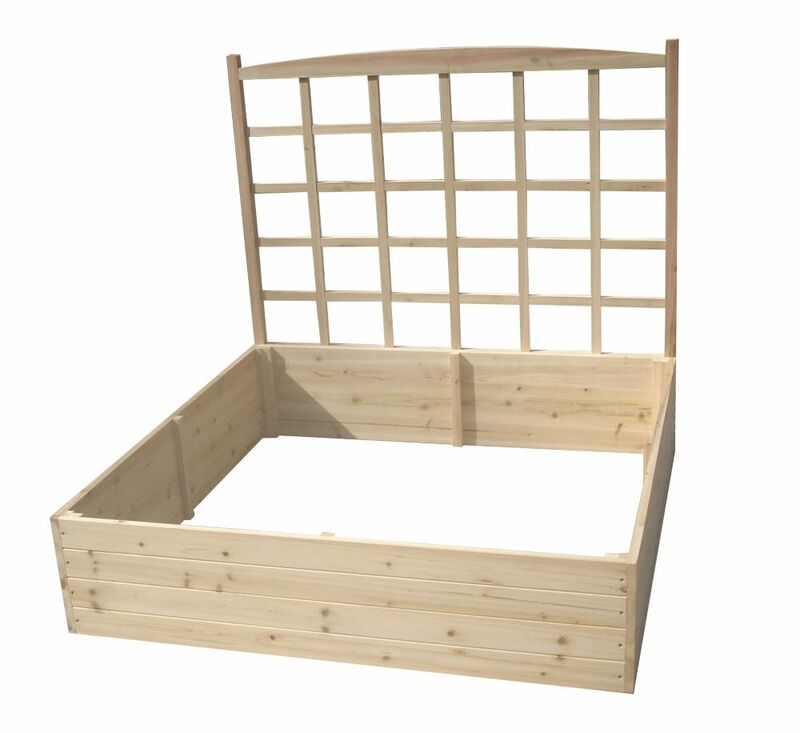 Constructed from solid fir wood (which is rot resistant) and easily assembled with a handful of screws and a Philips screwdriver, taking most under 1 hour to assemble, the Eden raised garden bed with trellis is both attractive and functional. Standing over 11 inch tall, this design allows for deep rooted plants and perennials. The garden bed is 4ft x 4ft and with the trellis stands at 44 inches tall. Each panel is reinforced to prevent warping overtime and add to the strength of the entire raised garden bed. The trellis is very easy to assemble with the simple Lincoln log locking system and is made from the same non-rotting fir wood to assure years of use. Raised Garden Bed With Trellis (4 ft. X 4 ft. X 11 inch ) W/ 44 inch Trellis is rated 4.7 out of 5 by 10. Rated 5 out of 5 by happyshopper123 from The SF Wood R Garden Bed was taken out of the box yesterday. (03/27/19) The guy that does my yard... The SF Wood R Garden Bed was taken out of the box yesterday. (03/27/19) The guy that does my yard work quickly put it together. It looks great! The garden soil was put in today. Now when the weather warms ,it's all ready for several tomato plants! Rated 5 out of 5 by Kris from I haven't actually built this yet, but the wood is solid and overall, it looks like this will be ... I haven't actually built this yet, but the wood is solid and overall, it looks like this will be easy to assemble. Rated 5 out of 5 by SkaterGuy from Great for growing tall plants. Easy to put together and very nice looking. Would Recommend. Great for growing tall plants. Easy to put together and very nice looking. Would Recommend. Rated 5 out of 5 by Katie from The raised bed was just what we wanted. It was very easy to put together. We had it planted that... The raised bed was just what we wanted. It was very easy to put together. We had it planted that day. If you want a small bed for herbs or flowers. We put star jasmine on the trellis. It is a fun element in our yard. Rated 5 out of 5 by Kevin from Great product, easy to assemble, looks fantastic. Great product, easy to assemble, looks fantastic.